Many of us have had love-hate relationships with our teachers. We can remember our favorites just as clearly as the ones we didn’t care for very much, and most likely, all leaving their own mark on us. One thing remains true, teachers make a tremendous impact in the lives of their students, helping to shape the person they’re destined to become. Were you born to teach? Read on and learn about teaching careers! What’s a day in the life of a teacher like? They are responsible for preparing their students for a variety of skills so they can be productive world citizens. Elementary school, middle school, and high school educators all teach grade-level appropriate lessons. They have to assess their student's abilities, strengths, and even their weaknesses. They have to communicate with parents, teachers, and administration on the progress of their students, as well as interact with the students on their own progress. A lot, if not the majority, of the lessons, are geared toward the state-required testing. Once the students have left the building, teachers will very often complete paperwork, fill in grades, hold conferences with parents, have discussions with other teachers regarding students, or help students after school. Sometimes, it’s a combination of everything just listed. Then, they’ll go home and prepare for the following days, whether it’s creating a lesson plan, grading classwork, or coming up with something new and exciting. The vast majority of teachers belong to their local teachers union. Unions are meant to give teachers a unified voice and help bargain with the school districts. It’s the whole “power in numbers” thing, and it works well for many teachers. Unions are prohibited from forcing anyone to join, so if you don’t want to, you don’t have to. Don’t let other teachers pressure you into joining, either. Many of them will, so feel free to press the ignore button. Unions provide their members with benefits such as legal aid and protection. However, membership does come with a cost that is taken out of your paychecks every month. The two largest unions are the American Federation of Teachers and the National Education Association. The American Federation of Teachers is traditionally aligned with the Republican party. It is in 43 states and has over 1.5 million members. The National Education Association is another strong union, which leans left (Democratic). Both are completely voluntary. Contrary to common myth, a pension is not free money bestowed upon teachers after retirement. The truth is, teachers get a percentage of their paychecks taken out, every single paycheck, and that’s where their pension is drawn from. The average teacher’s pension is in the mid-$40K range. Pension payout is computed by the amount contributed every month throughout their careers. If you only work a few years, you’ll only receive a couple hundred per month. But, someone who worked over 30 years will draw much more. If you pass away, your pension will be transferred to your surviving spouse, where they may receive either half or the whole amount. Depending on your state, you may also get social security. There are only 15 states that don’t participate in social security for their teachers. These non-participating states are Alaska, California, Colorado, Connecticut, parts of Georgia, Illinois, parts of Kentucky, Louisiana, Maine, Massachusetts, Missouri, Nevada, Ohio, parts of Rhode Island, and Texas. If you had previously worked in a social security participating job, then you’ll still receive compensation, only the formula will be different. Some children spend more time with their teachers than they do with their parents. A teacher who makes a positive impact can change many lives. It’s a big responsibility; do you have what it takes? Patience: Teachers need to have patience; they are working with students of varying abilities. It can be tough to watch students struggle, and sometimes, all it takes is the kind words of a teacher to help them on their way. Being patient is imperative to teaching. Passion: Many teachers feel their career is their calling. They are passionate about teaching children and helping them to navigate their way through that school year. Creative and resourceful: Schools are underfunded these days, which directly impacts the classroom. You will need to have the ability to figure out how to take what you have and use it wisely. Sometimes, that means enlisting the aid of parent donations. Sometimes, you may need to spend your own money to keep some supplies stocked. Flexible: The days won’t always go as you envisioned, but you know how to roll with the punches while keeping students engaged and learning. Collaborative: Teaching students is a team effort, even though just one teacher stands in front of the students. Teachers collaborate with other teachers, administration, and the parents, to ensure the best possible education for every child. Teaching careers come with quite a few perks. All the school vacations are also your vacations: From those long holiday weekends to summers off, one major perk to teaching is the vacation time. Plus, you’ll get a certain amount of paid vacation time annually, as well. You can even structure your pay to keep checks coming year-round, instead of just during the working months. Most states give their teachers 15 weeks off per year. You never know who you’ll inspire: Depending on what grade you teach, you’ll either spend the entire day with the same kids or have a different set pass through your door every time the bell rings. You’re helping to mold the minds of students who will one day go on to greatness, maybe because of something you said or did. It’s not a desk job: Teachers have a much better chance of achieving those recommended 10,000 steps daily. As a teacher, you’re probably not sitting much. You’ll be standing in front of your students teaching, moving around and keeping your circulation flowing. Pretty secure job: Most states have tenure laws that state after a certain amount of years, teachers have some job security. This number is different for every district. Health Insurance: One of the major bonuses of teaching is that most districts still provide health insurance for teachers and their spouses, even after retirement. In Michigan, health insurance is provided for 30 years after retirement. Bachelor’s degree: This is the minimum requirement necessary for getting into a career in education. In a bachelor’s degree program, you will take courses which will prepare you for being in a classroom. Whether you want to teach preschool or high school, you will have to get a bachelor’s degree first. Student teaching: Student teaching is a major factor in your education. 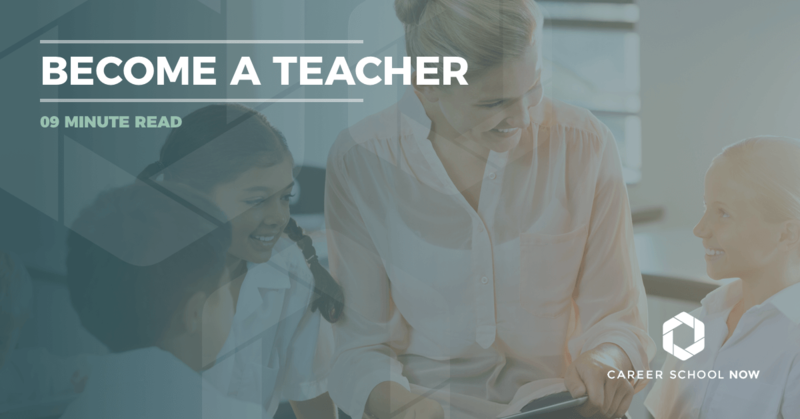 You’ll work alongside a mentor, or experienced teacher, to gain your classroom experience. Student teaching time frames vary by state. It can be done during your college school year, as an internship, or after graduation and before obtaining a teaching position. Get certified/licensed: Like most other professions, most states require a standardized licensing exam for those who desire to work as a teacher. These credential tests show if your knowledge is well-rounded. Which grade you are planning on teaching will determine which portion of the test you’ll have to take. The Praxis Series is used by 40 states, and it is set up to determine teaching eligibility. States have their own acceptable score range. There are three different tests for educators: math, reading, and writing. There is also the subject assessment segment, which has multiple choice and essay questions varying from one to four hours depending on the subject you’re testing in. There are over 90 different areas, and you can take up to four tests per test date. The National Evaluation Series is a newer program given through Pearson, which is an organization specializing in professional development, teacher education, and educational technology. Each state sets their own requirements; check with your state’s board of education to find out which ones are required for you. Higher education: Having a bachelor’s degree is great, but a master’s degree makes you even more desirable to school districts. A Master of Arts in Teaching (MAT) or Master’s of Education (M.Ed.) can contribute to making you a more marketable, and better, teacher. The more in-depth your understanding is, the better suited you are to shape your students. A master’s degree will take between one and three years, depending on what you’ll be specializing in. Master’s of Arts in Teaching will focus on classroom careers. This is the degree mostly pursued by students wanting to teach students. A MAT degree curriculum will go into depth on how to be a teacher, everything from the method to the approach. Master’s in Education: The M.Ed is meant more for those wanting to go beyond the classroom, and work more in the administration aspect of education. You can still work as a teacher with this master’s degree, but you’ll also be eligible for a broader career ladder. Within the M.Ed, there are three major areas: Curriculum and Instruction, Counselor Education, and Educational Administration. Per the Bureau of Labor Statistics, the national average salary for elementary school teachers is $55,490, and high school teachers is $58,030. According to the National Education Association, the average national starting salary for teachers is in the low $30K range, and this is for someone with a master’s degree. Realistically, it’s somewhere in the middle. Teachers salaries start lower than most other professionals, and the gap widens the more years they teach. Teachers mostly see pay cuts; rarely do they get raises anymore. Unlike many other careers, if a teacher moves to another district, they don’t receive employment packages or incentives. Too frequently, they will even see a salary cut. Here’s a fact about teacher salaries: Teachers are often unable to pay off loans, afford houses, or send their children to college. Teachers very often have to work more than one job to make ends meet, and they generally have a two-income family. Teachers teach because they feel a calling, not for the money. ARE THERE AVAILABLE TEACHING JOBS? Teaching careers are expected to grow about average at eight percent, but it does depend on the region you’re teaching in. Overcrowded classrooms will be one of the impacts of a less than substantial employment growth, and the average class size will continue to grow. Budget cuts will create layoffs, and generally, teachers are the first ones impacted. Teachers are among the most influential people our kids come into contact with. It’s so important to be sure that teaching is what you want to do. Any negativity reflects in how teachers treat their students. Lifelong learners are created by lifelong learners who make an impact. Is that you?